Some claim that the use of candles to decorate trees can be traced to the Roman celebrations of Saturnalia. Decorating with evergreen trees and boughs was later believed to evoke thoughts of spring, good cheer and hope. The use of mistletoe dates back to the Celtic Druids who saw the plant as a symbol of peace and joy: Enemies who met under mistletoe in a forest would lay down their arms and embrace, a custom that has led to our modern habit of kissing under the mistletoe. In the Middle Ages, the “masculine” holly, its green branches accented by bright red berries, and the “feminine” ivy, were used together to ward off evil spirits and to symbolize eternal life. More modern traditions have brought us the poinsettia. Once seen as a sign of purity by the ancient Aztecs in Mexico, it is now the most popular of the Christmas flowers. 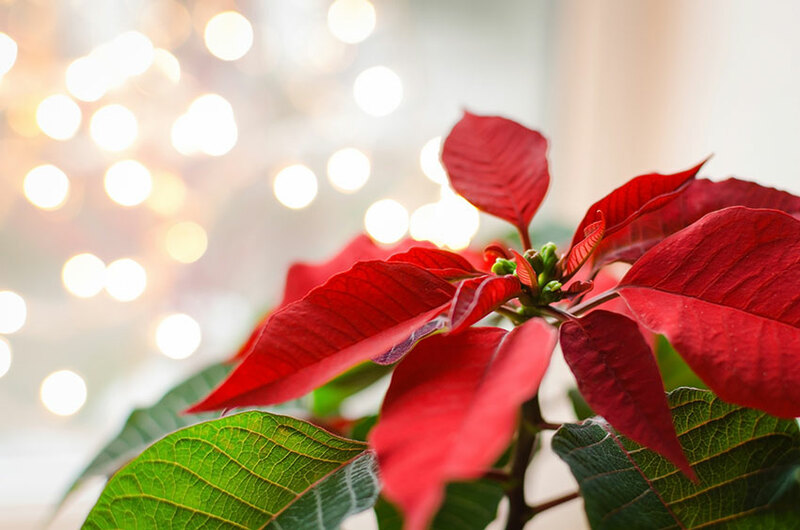 A Mexican legend describes the evolution of poinsettias from Aztec symbols to Christmas flowers: A poor boy who had no money for a gift to offer Christ on Christmas Eve picked some weeds by the roadside and when he got to the church, they blossomed into the beautiful red of the poinsettia flower, causing many to claim they had witnessed a Christmas miracle. When decorating for Christmas, people are often inspired by Christmas flowers. Since many design professionals recommend that you choose a colour scheme before starting your holiday decorating, you can look to Christmas flowers, an important part seasonal décor, when selecting a festive colour palette. Start with your flowers and then carry the theme to other design elements. Red and green – These are the standard colours of Christmas flowers and plants and, therefore, of Christmas decorating. The two colours contrast beautifully, as the continuing popularity of holly and poinsettias demonstrates. Green is also the colour of the fir and cedar boughs that are used in many homes. To add red to your evergreen sprigs, consider ribbon, bows, candles and even cranberries! Red and white – Every child loves a candy cane, that enduring red and white symbol of Christmas. With all of the choices in Christmas flowers, it is easy to create floral arrangements using these two colours. Poinsettias are available in red and white. Or, go beyond traditional Christmas flowers: think carnations and chrysanthemums in striking shades of red and white, or white lilies or freesia accented by ribbon or candles. And paperwhites make a lovely and fragrant addition to holiday décor. Monochromatic – Pick one colour and use various shades for decorating. Christmas flowers and plants come in so many colours that they can be easily incorporated into a monochromatic colour scheme. Try a palette of greens, from sage to spruce, or a dramatic winter white motif. Accent your Christmas flowers in a way that suits your décor. Add metallic elements for a modern look – gold offers a stunning complement to red or winter white, and silver offers a beautiful accompaniment to green. Use natural materials for traditional decorating – arrange pine cones and evergreen sprigs on a tray or plate, or create nosegays of twigs, leaves or flowers. With your colour palette, your imagination and a few Christmas flowers, the possibilities for festive decorations are limitless! With online delivery of a bouquet or flower basket gift, decorating for Christmas day has never been easier!